Enjoy the comfort of getting your shirts washed and pressed to crisp perfection by our experienced and professional staff. We use the expert BMM Western shirt machine that ensures all collars, cuffs and shirts are pressed to perfection. The machine can cater to all shirt sizes, shapes and cuts leaving an outstanding quality of finish. Whether you want your shirts washed and pressed, or simply just pressed by our specialist staff, we can do it. So look no further, come to Everclean for that perfect finish on your shirts that will leave you and your company looking flawless. Contact Everclean now on 0800 050 9626 to speak to one of our experts in Golders Green . 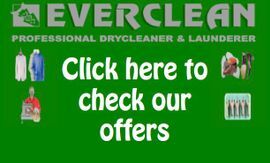 Alternatively, send an e-mail to info@evercleandrycleaners.co.uk to discuss our pricing and the services we offer. Enjoy whiter whites today!